An interesting and extremely dark mystery / drama, this one works in the department of tone, (there’s also plenty if black comedy thrown in,) but the direction the storyline moves in leaves something to be desired. This is a pretty cool movie that works for almost the whole way through, but unfortunately drops the ball a little in the final act. The premise is interesting enough. A man is a suspect is the murder of a young girl, and the police detective assigned to the case, as well as the girl’s father team up to torture him. They want answers and until this man gives them up, it’s an anything goes situation. Prisoners handled a somewhat similar premise much better, making a whole mystery out of it, whereas Big Bad Wolves wants to leave more up to the audience to figure out. That means that it doesn’t give us nearly enough answers. We are left feeling somewhat unsatisfied by the end, but up until that point, the film is wickedly dark and funny. Big Bad Wolves is an Israeli movie about a child murder suspect and the men who torture him. It’s a movie that is pretty artistic and dark as hell, while at the same time being sprinkled with a good dose of black comedy. The premise isn’t anything spectacular, but it is somewhat that we haven’t exactly before, and the wit and dialogue help make the familiarity angle all seem fresh. The problem is that there’s not a huge story here to tell, and if there is, then this movie certainly doesn’t tell it. You see, nearly the entire movie takes place in the basement of a house. Filmmaker Quentin Tarantino has gone on record about how much he loved this movie, calling it the best film of 2015. That’s not surprising considering that this is in many ways a combination of Reservoir Dogs and The Hateful 8. It’s also quite a lot like Prisoners, the great Hugh Jackman-Jake Gylenhaal movie from the same year. But what this movie lacks that those other films have is follow-through. 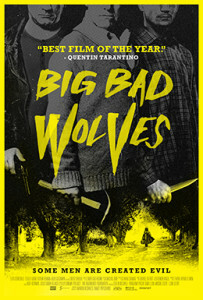 Big Bad Wolves has a fine first two acts, but the third act doesn’t really offer much of anything. Now that’s something you will never find in a Tarantino film. His third acts are where everyone, or nearly everyone, dies. It’s just a matter of figuring out the how and why. Tarantino’s third acts provide answers and reveals. In Big Bad Wolves, we don’t get nearly enough of those. The movie starts with a scene of children playing hide and seek in the woods. Everything happens in slow motion, and yet fast enough that with no frame of reference, it’s not very clear what it all means. Turns out, one of the girls from that game goes missing and has been kidnapped. And then we go to an abandoned building where we watch two detectives overseeing the beating of the man they suspect. The detectives are Micki (who has a real Alan Tudyk look to him,) and Rami. The man being beaten is a school teacher named Dror. It isn’t Micki and Rami doing the beating, but two other guys who Micki has hired. He and Rami stand by watching, playing out a sort of good cop / bad cop situation. Micki supports the beatings and even takes part in them. Rami is against them, and strongly objects. And in the background, where none of them can see or notice, a kid goes by, pulls out a cell phone, and records the whole thing. The body of the girl is found and it is tied to the chair, in the middle of the woods, without a head. We meet the girl’s grieving father, Gidi, for the first time, in this scene. Micki is taken off the case. He screwed up evidence or dropped the ball in some way, and it’s given to Rami. But then things get worse for Micki. Thr tape surfaces of him and those other guys beating the suspect. This leads to the suspect being released from prison and Mickey getting fired. Before letting him go, however, the Chief gives Micki a message about how since he’s no longer working for the law, and representing the law, he has the freedom to explore other avenues of funding out what he wants to know. Ands that’s exactly what Micki does. He and Gidi are both following the suspect. Dror, at the same time. Micki kidnaps Dror. Then Gidi comes up and kidnaps then both. He brings them to his basement, where he and Micki realize that they’re on the same side and take turns torturing Dror. Only they get nowhere with this, and soon Gidi has his attention called upstairs, as his father shows up at the house with some chicken soup. There are some pretty great things about this movie. One is the way that the house is setup. We are with Gidi when he goes to buy the house, asking the real estate agent to scream as loud as she can, and for as long as she can, in the basement, while he moves around the house upstairs and also walks around outside. He wants to see if her screams can be heard, and tells her it’s because his son will be playing the drums in the basement and he doesn’t want to hear the noise. We hear a number of conversations and mentions of how the house is surrounded by Arab villages, and how that makes it less desirable, and makes Gidi seem like a fool for buying it. In these ways, understanding the house and its importance to the story, becomes a pretty cool priority for this movie. And there are countless shots of slowly moving down the hallway that leads to the basement, and in many ways resembles a long and creepy cave. Another clever move, on the part of the story, is bringing in the father. Gidi might be an elderly father himself, but his own mother and father come into the movie in a no ways, (his mother via phone all conversations,) and it’s all pretty comedic. The mother basically sends the father over there, to check up on Gidi, thinking her son has gone crazy. And the father discovers what his son is up to. Instead of freaking out or calling the police, the father decides to help. It’s at this point that Dror tells Gidi a location where he can find the head, Gidi goes off to find it, and Micki (who is also improsoned at this point in the movie,) escapes. That’s when he learns of the disappearance of his own daughter, and tries to rush back to the house to get answers from Dror before Gidi and his father kill him. The movie works for about three quarters of the way through. The premise is certainly great, and so is the twist of having the father show up. But the new direction the movie goes in, during the second half, becoming about Micki’s daughter feels kind of rushed and inconclusive. The answers are there, but it doesn’t seem like we get enough of them. We just leave the movie feeling sort of unsatisfied. If this film has a stronger final act, it would have been a great movie, but for s mystery-thriller, the finskmact id the most important part, and if it’s not sting enough, it can ruin the whole vibe that the movie had going for it. In Big Bad Wolves, the ending isn’t so bad that it ruins that came before it, or anything like that, but it just doesn’t deliver on the momentum and potential that this movie developed in its first three acts.